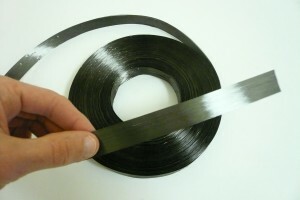 A unidirectional carbon fiber tape is a reinforcement tape that consists of several thousand parallel carbon fibers lightly bound together. Tape mechanical properties can be tuned by selecting the adequate number of fibers and the carbon type: high modulus or high strength. Other materials such as Kevlar or flax fibers can be used alone or commingled with carbon fibers to enhanced properties such as toughness, lightness or vibration damping. Carbon fiber tapes are available in Young modulus up to 436 GPa, tensile strength up to 4900 MPa and carbon density as low as 20 g/m2. For comparison: titanium Young modulus 114 GPa, tensile strength 620 MPa. Do you need a custom tape ? Please use the contact page. Carbon fiber tapes main properties are strength, rigidity and lightness. They can be used as localized reinforcements such as in the construction of model airplane wing spars. Tubular products can also be obtained from carbon fiber tapes by the filament winding method. Compared with carbon fiber yarns, carbon fiber tapes have a higher covering factor (faster production) and a lower area density (lighter composite parts).